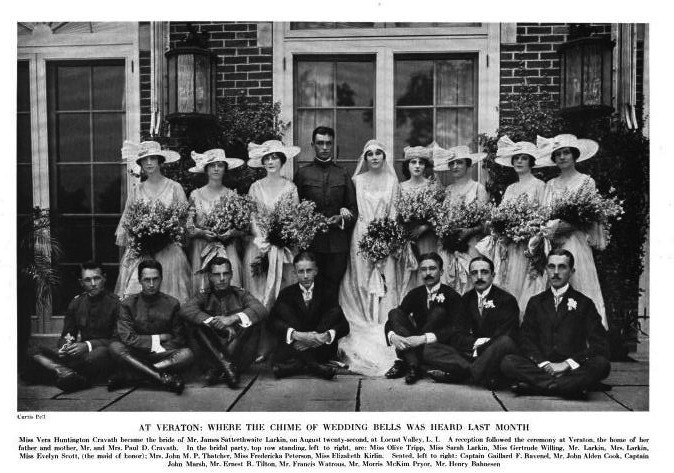 A wedding photo from the marriage of Vera Huntington Cravath, daughter of Paul D. Cravath of 'Veraton', and James Satterwhite Larkin, taken on August 22nd, 1917 in Locust Valley at the Cravath estate. Click HERE for more on 'Veraton'. Photo from Town & Country, 1917. So, that’s what a NY society wedding party looked like 94 years ago when America was helping fight the ‘war to end all wars’ – oh, how little they knew. Good looking group, I hope the newlyweds had a happy marriage even though no one is smiling in the photo; we know the good looking house in the background didn’t last all that long. I like the men sitting on the stone patio because it’s not something you’d see groomsmen do today. I’m also curious why the second groomsman from the left, Mr. John Alden Cook isn’t referenced by his military rank as the captains on either side of him are … did he not want to called Private? There, enough comments from me. I love this photo. I hope you post more photos of family occasions. It's so interesting to learn about the families who lived in these great houses. I, too, often wonder what became of them. Thanks, Zach. 'When Vera Cravath Wed' Good short story title. DED, good story … it reminded me that, I believe Mansions has/had a link to an old & short-lived TV series “The Pruitts of Southampton” (starring Phyllis Diller) about a family with a pedigree name but with less cash than their butler. I’d be interested in hearing any other similar stories anyone else has to tell, changing names to protect the innocent of course. I’d lead off but I really don’t have an interesting story like DED’s … just some widows and/or children who were very disappointed. I also love these old photos of the gentry-folk. I find it odd that the Cravath estate burned twice. I thought I heard once that both times arson was to blame. Does anyone know if there is any truth to that? The first fire was found in a kitchen dumbwaiter by a maid. The cause was believed to have originated "from a live coal in a coal scuttle on the dumbwaiter, which ignited some aprons which hung in the dumbwaiter shaft. The flames caught the woodwork and a strong draught drew the fire swiftly up through the shaft to the attic." It took firemen 45 minutes to respond. The second fire was credited to "defective insulation".